Our 1 owner car was acquired at a cost of £22000 in 1989 from Hedingham Car Centre with low mileage, and stated to have been on display at the 1988 Motor Show. Only reason for purchase of new one because our SE6 was written off by a young niece. What a difference! On the whole the vehicle has been very reliable but had a new gear box in the nineties. Initially used on a regular basis by us but now only brought out in dry weather and for the occasional MESS outing. 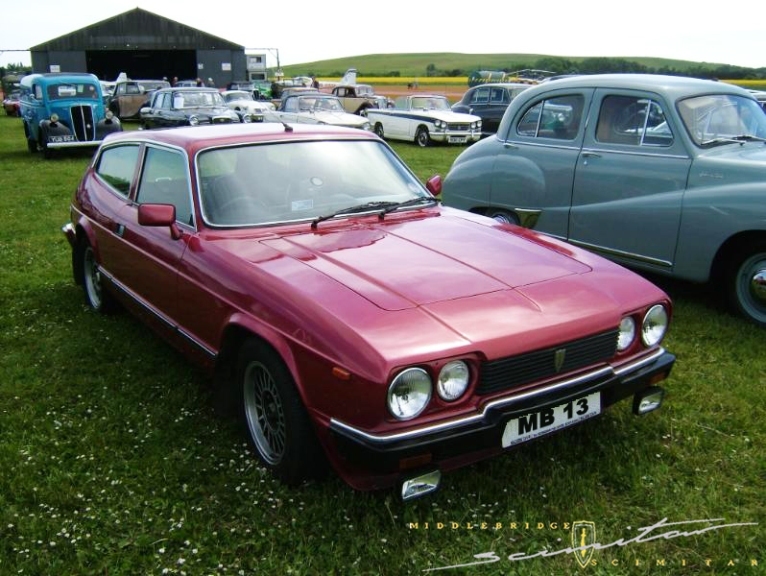 We have toured in this Scimitar and the previous one, all over Europe, including trips in winter to Austria, where chains had to be fitted to get to various resorts and travelling over the passes. Only one noteable incident, early in 2000, travelling to Carlisle, when a probably ton-weight round bale of hay fell off a waggon travelling in the opposite direction. We took hasty evasive action, swerved on to the verge and cowered together on the passenger seat. The bale rolled right towards the Scimitar, hit the offside and took off all protuberances, including the mirror.